I thought it was a misprint when I saw this Downhill Mountain Biking Helmet for $40 over at JensonUSA. I found it in their closeout section. After reading the description and thinking, yes, I hate small helmets that don't fit my 7 and 1/4 hat sized head, and yes, I hate how my chin is exposed on other full faced helmets, and yes, I hate paying $200+ for a downhill bike helmet . . . I wasted no time in ordering. 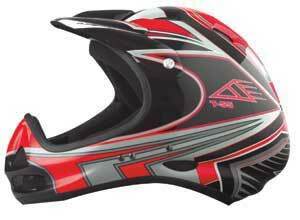 As usual, Jenson had the Azonic T-55 downhill helmet to me in about 3 days. First things first. The helmet looks better than the photos. I mean, it was well made, and looked better than some of my motorcycle helmets, but yet it weighs less. The fit was incredible. Very comfortable and great protection around the jaw which opens up a larger area for vision. I took the helmet out last Saturday on a 3.5 mile climb from Tony's Grove to White Pine Lake, then down Bunchgrass (all up Logan Canyon in Utah). The climb was with temperatures pushing 90 and I must say the helmet was a bit hot. Had to pull it above my face. However, during the decent it felt perfect, held steady, and provided no loss in visibility that I've experienced with other helmets. Bottom line is you can't get a downhill helmet for this low of a price. Especially one this good. Search on JensonUSA for "Azonic T-55" to purchase (or look in their Closeout section).